Companionship Quilters meets the 3rd Monday of each month for a time of sharing and learning. Completing a beginning quilting class is recommended before joining, but any skill level is welcome! Contact Betsy Ercolini with questions. Tuesday Evening, July 31st is the third and final of our Summer Oasis series with an evening of Simply Scrumptious! Kathryn Dron and Brittany Kukal will be presenting ideas for simple summer food and menus, decorating tips and organizing ideas that will help you plan fun, creative and fuss-free summer barbecues and other gatherings. Kelly Curran, Women's Ministry Director, has a few things to say about food that really satisfies! Come join us for a great evening, some yummy treats and there will be some fun giveaways too! Looking forward to seeing you Tuesday evening! Tuesday Evening, July 24th is the second our Summer Oasis series with an evening of Simply Beautiful! Angela Welsh, of Angela Welsh Designs, will be talking about good hair care and the do's and don’ts of hair tools and product purchasing to give you the healthiest head of hair! High school age and older welcome. Refunds before February 25th. Mary Jo Sharp founded Confident Christianity - a Christian apologetics ministry that addresses the hard questions of Christianity through research, writing, training and debate. Smoked turkey on freshly baked ciabatta with creamy havarti cheese, pesto-balsamic aioli, mixed greens and tomato. Includes: Tim’s chips, fresh cut fruit cup, a delicious cookie, bottled water, utensils and napkin. Served on freshly baked whole wheat ciabatta with pesto-balsamic aioli and leaf lettuce. Includes: Tim’s chips, fresh cut fruit cup, a delicious cookie, bottled water, utensils and napkin. Marinated chicken breast tossed with red and green cabbage, carrot, green onion, ramen noodle, sesame seeds, toasted almonds, and mandarin oranges. Served with our sweet and "zingy" Oriental dressing. Includes: A fresh baked roll with butter, fresh cut fruit cup, a delicious cookie, bottled water, utensils and napkin. Asian marinated chicken with our Asian Vegetable Slaw and peanut sauce all wrapped up in a spinach tortilla. Includes: Tim’s chips, fresh cut fruit cup, a delicious cookie, bottled water, utensils and napkin. Smoked turkey with creamy havarti cheese, pesto-balsamic aioli, mixed greens and tomato. All of our gluten free sandwiches are made with Essential Baking Company Gluten Free Super Seeded Bread. Each Gluten Free Box Lunch is made with gluten free ingredients including Tim’s Chips, fresh fruit, bottled water and our gluten free cookie. and carrots. Served with house-made Honey Lime dressing. Each Gluten Free Box Lunch includes Tim’s Chips, fresh fruit, bottled water and our gluten free cookie. * FROM THE CATERER: Our gluten free lunches are made with gluten free ingredients, but all are also produced in a facility where there is a potential of cross contamination with wheat. We do our best to prepare all gluten free items separately, but we do not guarantee 100% gluten free. 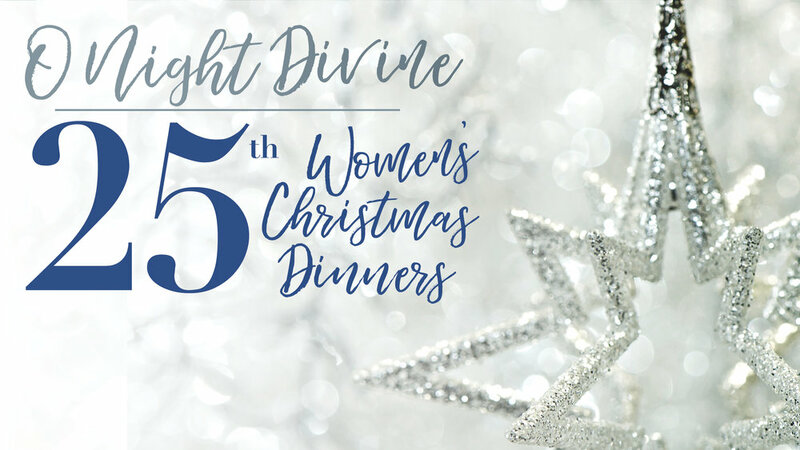 We are so excited to invite you to one of three festive and fun filled evenings for our 25th Annual Women’s Christmas Dinners, November 29, 30 & December 1. We are pleased to feature the outstanding music of Scott Krippayne. Please pray about how you will be involved, whether you will hostess a table or just bring a friend who needs to hear a clear and gentle presentation of the good news of Jesus Christ. Who will you invite? Great food, great friends, beautifully set tables, a great reason to gather! Mark your calendar and save the date. We can’t wait to celebrate with you!! Welcome the Christmas season by serving as a table Hostess. We need 132 Hostesses to set the tables in the Worship Center to make a place for everyone who would like to attend! Being a Hostess is a fun and satisfying experience where you bring your personal, unique touch in setting and decorating the table of your choice. If you plan to invite more then 4 friends, please plan to hostess a table. What’s involved? Hostesses set their tables on their event day between 10:00 and 3:00. Plan at least one hour to set your table. The time you spend preparing your table is a great opportunity for fellowship, especially if you share Hostess privileges with a friend. Consider leaving a few spots open (or the whole table!) to minister to those who cannot serve as hostesses but would like to bring guests! Can’t be a Hostess? Just come and bring a friend! Individual tickets will be $20 as space is available beginning November 12th. All seating is reserved and assigned. Ladies ages 18+ welcome. The evening just would not be the same without the Gentlemen who so graciously volunteer to serve us! Men 18+ may sign up between Sunday services in the foyer beginning October 29th. Contact Marcia Nielsen by email or (253) 377-2750. Childcare will be available for children 5 and under during setup for Hostesses from 10:00 to noon each day, and in the evenings for Dinner. Contact Val Davis by November 19th to RSVP. Meets the 1st and 3rd Thursday morning of the month in the Fireside Room. Registration required. Are you a new gal to the neighborhood? Maybe you’ve been here awhile but haven’t really “rooted.” Moving ranks among the top five stressors, but you are not alone. Join us for a book study through After the Boxes are Unpacked, by Susan Miller, to process and find hope in God’s Word with new friends. Wednesdays 6:30-8:00pm, September 20 through November 15. Contact: Anna Clagett. Care for children 3 and under is available by reservation for $30 per child for the 9 week class (you can register them when you register). For children age 4 through 5th grade, Awana is available for $40 per child. Awana runs through May 2018 and is a wonderful program that they can enjoy long after your class is completed. Register for Awana here. Junior High and High School groups run at the same time and they are without cost. A men's group is also available on Wednesday night. Bring the whole family! Email Anna Clagett with questions or for more information about the class. For childcare questions please contact Laurie Werre. We get together the 4th Saturday of each month (approximately) in the Fireside Room (usually) for Friendship Quilting Day - a day to just get together and quilt! Contact Betsy Ercolini with questions. Meet every other Tuesday Evening. Join any time! Meet every Tuesday morning. Join any time! We get together the 4th Saturday of each month (approximately) for Friendship Quilting Day - a day to just get together and quilt! Completing a beginning quilting class is recommended before joining, but any skill level is welcome! Contact Betsy Ercolini with questions.